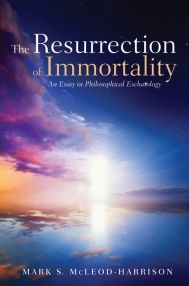 McLeod-Harrison’s new book, The Resurrection of Immortality (Cascade, 2017) is a welcome contribution to the growing literature related to personal eschatology. His concern in the book is to explore the question of human immortality. Historically, parties to the debate have generally affirmed either that human beings are essentially immortal or conditionally immortal. Those taking the first view maintain that by nature human beings will live forever. As human beings we naturally possess the property of immortality. Conditionalists deny this, maintaining that humans may or may not live forever. God grants immortality to some, depending on certain conditions (e.g., redemption in Christ). But what is it, exactly, about human beings which constitutes our structural value? McLeod-Harrison’s answer: “the main reason humans have structural value . . . is that we are morally responsible because we are self-determining things” (39). 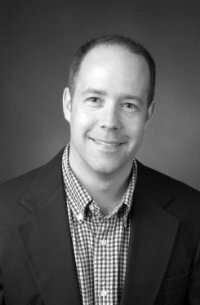 And herein is the crux of the book’s entire argument: “Humans have metaphysical value because of robust free will.” And by “free will” McLeod intends not only libertarian free will, but the sort of freedom that also implies divine risk in creating us, since it entails the possibility of evil. McLeod-Harrison concludes, then, that God would never destroy a human soul since this would be “to challenge the structural nature of love that God built into the universe in the first place. God doesn’t destroy human souls because God can’t metaphysically do so. The metaphysics of the world is good, structured by love. To remove the thing that allows for love in a human is to disvalue the very structure of the world” (42). So what about the possibility that we humans can bring about the cessation of our own souls? The author takes up this question in the next chapter. Given his conclusion that it is metaphysically impossible for God to destroy human souls, the answer to this question is straightforwardly simple: “if not even God can bring about the cessation of humans, then humans won’t be able to either” (50). In the book’s final chapter, McLeod-Harrison expounds further on the notion of immortality as a “strongly enduring property,” that is, one of a number of properties “such that once one has them, there is no time one doesn’t have them” (52). Because it is irrevocable, he tells us, humans may be said to possess “immutable immortality.” He also further develops his view of providence, which is pivotal in his argument—the notion that God takes a “hands-off policy” when it comes to human choices (56). As is generally the case with open-theists, this approach is entailed by his view of human moral autonomy. As he puts it, “whatever else is essential to the human person, self-determination and the concomitant free will are the central features of being a human person and, indeed, the very individual human person one is” (60). So, if successful, McLeod-Harrison’s argument demonstrates that all human beings must live forever—in some condition or other. As for whether the lost suffer everlasting torment in hell (traditionalism) or are eventually all saved (universalism), he observes that “natural immortality is neutral in that regard” (26). But at the close of the book, he suggests that “Perhaps [universalist] Thomas Talbott is right. Ultimately God will—indeed, must—remove all limitations in humans so they can see that the only rational choice is to move toward God. Under those circumstances, everyone will move toward God. So eternal conscious punishment need not result from immutable immortality and hell will eventually be emptied” (69-70). It appears, then, that McLeod-Harrison at least leans in a universalist direction. So what are we to make of McLeod-Harrison’s arguments? First, I will make a logical point about an aspect of his argument. In chapter 3, he reasons from moral permissibility to metaphysical possibility in problematic ways. The application of the Kantian “ought implies can” intuition seems inapplicable in this context. And, in any case, the argument he presents actually goes from “ought not” to “cannot” which suggests that his argument, at least in chapter 3, might commit the fallacy of denying the antecedent. From “if X, then Y” it doesn’t follow that “not-X, therefore not-Y”. Thus, although moral permissibility may entail metaphysical possibility, it doesn’t follow that moral impermissibility entails metaphysical impossibility. Secondly, as noted, McLeod-Harrison’s methodology is thoroughly philosophical and does not incorporate scriptural exegesis. Generally speaking, this is all well and good, but there are some critical junctures in his argument where the discussion really begs for some exegetical input. For example, such passages as Acts 17:28, Romans 9:20-21, and 1 Corinthians 6:19-20, not to mention the entire Genesis creation account, are directly relevant to the whole matter of divine ownership of human beings. Readers would be interested to know the author’s take on these passages, as well as numerous other biblical texts which seem to suggest a strong sense of divine ownership of human beings. Another major issue where Scripture directly bears upon his argument is the doctrine of providence. McLeod-Harrison explicitly affirms an open-theist “hands-off” doctrine of providence which is arguably at odds with the biblical doctrine that God directly governs even human affairs. (For some extensive critiques of open theism, see books by Bruce Ware, John Frame, and myself.1Bruce A. Ware, God’s Lesser Glory: The Diminished God of Open Theism (Crossway: 2000); John M. Frame, No Other God: A Response to Open Theism (P&R: 2001); James S. Spiegel, The Benefits of Providence: A New Look at Divine Sovereignty (Crossway: 2005).) Finally, Jesus’ reference to God in Matthew 10:28 as the one who can “destroy” the soul in hell is also pertinent to this discussion, as it seems to challenge McLeod-Harrison’s thesis. Some attention to this passage would also be welcome. Fourthly, McLeod-Harrison assumes that human beings are entirely self-determining and thus forecloses in favor of a particular libertarian view of human freedom. For all we know, libertarianism is false and a compatibilist view of human freedom (which is affirmed by a large number of philosophers, both currently and historically) is the correct view. Now this libertarian assumption, along with the presumption of an open theist view of providence, are critical to the author’s argument. So the argument will only be useful for readers who share these views. But notice that these very assumptions further restrict the author’s sympathetic audience, since they rule out universalism. If human beings are entirely self-determining, then there is no way for God to guarantee (that is, determine) that all people will ultimately submit to him for redemption. McLeod-Harrison suggests at the close of the book that God may “remove all limitations” so that the “only rational choice is to move toward God” (69). However, if people are truly self-determining and are not bound even by reason, then even this doesn’t guarantee that all will ultimately come to God. Finally, there is a significant problem with McLeod-Harrison’s Master Argument. Why assume without qualification that “the permanent cessation of a human is a metaphysically bad event that undermines the divine nature”? Even granting the author’s reasoning about structural values, this doesn’t preclude the possibility that these values may be overridden such as by considerations of justice in response to extreme human wickedness, which conceivably warrants the complete annihilation of certain human beings. If human wickedness is itself a horrific offense against God, then wouldn’t the persistence of such rebellion for all eternity “undermine the divine nature”? And if universalism cannot be expected or even plausibly hoped for (as this is precluded by the author’s open-theism), then the only way to avoid such a “metaphysically bad” state of affairs is for the damned to be annihilated. It would seem, then, that McLeod-Harrison should take the conditionalist position more seriously, given his emphasis on the structural values he so prizes. 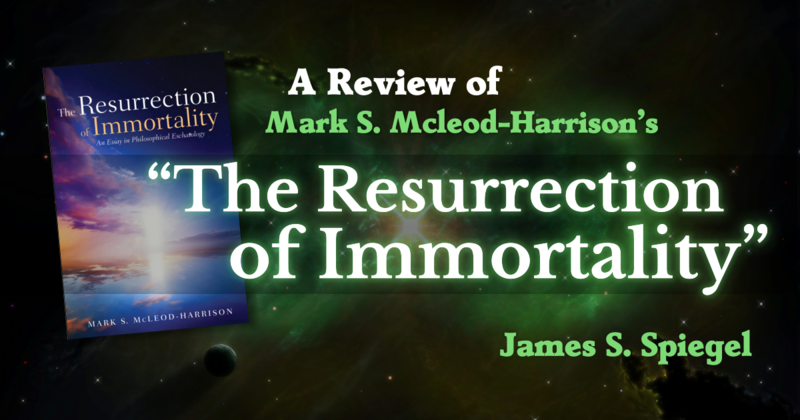 Despite these problems and my obvious disagreement with McLeod-Harrison on many points, I do believe The Resurrection of Immortality is a valuable study of an important issue. In many ways, the book advances contemporary scholarship regarding personal eschatology as well as philosophical anthropology. 1. ￪ Bruce A. Ware, God’s Lesser Glory: The Diminished God of Open Theism (Crossway: 2000); John M. Frame, No Other God: A Response to Open Theism (P&R: 2001); James S. Spiegel, The Benefits of Providence: A New Look at Divine Sovereignty (Crossway: 2005).